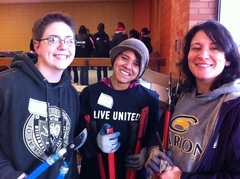 The two Reed vans idled in the light snow outside 28 West as 30 Reed students readied themselves for a day of service. It was Martin Luther King Day and schools, post offices, and banks across America were closed to celebrate the birth, life, and work of Rev. Dr. Martin Luther King Jr.
Every year Students for Education, Empowerment, and Direct Service (SEEDS) offers a service trip so Reedies can make a difference. This year 43 Reed students, professors, and staff joined more than 800 other college students from across the Portland area to volunteer at Roosevelt High School, explore education as a civil right, and respond to what Dr. King called "the fierce urgency of now." Roosevelt High School hosted this year's rally and service projects. Once labeled a failed high school, the North Portland institution is on the rise. Last year 89 percent of its senior class graduated, its highest rate ever. Anthropology major Amina Rahman '14 has been working with students in Northeast Portland this year. MLK day has traditionally been associated with service and this struck a chord with her. "I felt motivated to use the day in a productive way that would benefit kids like me, who live in my city but face different realities," she says. "School is very much about support, and the idea of bolstering a high school with the help of anonymous college students is super cool, and I think, effective."